It was never going to be a straightforward task to create this stadium. Even the most basic aspects of the stadium such as the pitch and goalposts are so completely different from the traditional Subbuteo equipment that I knew I would need to get creative in order to make this work. Then I began to think about the more detailed aspects of the Gaelic match experience and realized that this project was going to be an extremely challenging task. Here I outline some of the challenges I have encountered and any solutions I have used or am considering. Also, with some issues i will discuss two alternative versions: one for a scale-model and the other for a playable game. The first and most obvious challenge was the unavailability of 15-man squads, other than the very old Subbuteo rugby teams. Furthermore, the county colours were never used in Subbuteo. However, this was one of the easier goals to meet. Individual unpainted players can easily be bought on the Internet, so purchasing a 15-man team was not going to be too difficult. My first purchases were two sets of 15 2K4 players. I will be painting these first two teams in the colours of Kerry and Dublin in honour of the great rivalry of the 1970s. The pitch has been marked out in 1:100 scale on a piece of green baize measuring 100cm X 150cm. However, for the playable version, some license needed to be taken with the markings on the pitch. In order to accomodate the goals, the penalty area needs to be slightly larger. However, this should not drastically affect the overall look of the pitch. The goalposts provided a major challenge. They are one of the most vital components of the game, so I was determined to find the best solution to the problem, keenly aware that if this failed, the entire project would fail. I found two Subbuteo rugby goalposts on eBay which I hope will be of benefit. However, given the slight difference in sizes between rugby and Gaelic goalposts, I was aware that this may not be as simple a solution as adding nets to the rugby posts. The most likely solution I considered was to trim the rugby posts and glue them to the front of a Subbuteo soccer goal. While still not quite to scale, this is probably the best solution available. As it turned out, the rugby goals did not need to be trimmed as they were not too high in relation to what I considered for Gaelic goals. Furthermore, they matched up almost perfectly with the original soccer goals, so I had a choice of either attaching the nets to the rugby goals or attaching the rugby posts to the soccer posts. I opted for the latter approach and was pleased with the results. The first of the aesthetic modifications to the game, I gave some thought to ways of creating umpires, including painting over some of the support staff some as managers or doctors to give them the long white coats. However, I soon realised that their attire is very similar to that of cricket umpires, although I did not wish to purchase four different Subbuteo cricket box sets just for the umpires. Fortunately Pete Whitehead, who runs Subbuteo World, was kind enough to track down four individual cricket umpires for me. Incidentally, Subbuteo World is where I buy much of my table football equipment. The green and white flags will simply be made out of pins and paper. These pins can then be stuck into the pitch beside the goals. Incidentally, this same approach will also be used for the sideline flags. After spending some time searching, I found a 51-piece unpainted German military band made by Preiser. They are slightly smaller than the footballers, since they're in HO scale. Still, it's meant to be a boys band, so I'm guessing it will work out. I'll need to change the banner that they carry, and they wear berets instead of the traditional Artane Band caps, but I don't think that will matter much. For the moment, my plan is to fashion sticks out of "green stuff" and gluing them to the players hand. Obviously they won't actually be usable in a game! Since they will only be there for aesthetic value, the likelihood is that I will not be using them to make many teams. At the moment I only have plans to make a Kilkenny hurling team as they don't have a football team. This will be a piece of black cardboard, roughly the size of a credit card. I will cut slots into the card to insert team names and scores throughout the match. The names and scores will be printed in yellow writing on black card, using the lucida console or Courier font to give them the appearance of being electronic. My original idea was to build something similar to the scoreboard, with pictures from a few football and hurling games. However, my brother suggested that I could use a small digital photo frame to serve the same purpose. Having said that, the frame in the picture (left) is a bit small compared to the Zeugo stands. I suppose i will eventually get two big screens and either use one of them as the scoreboard or have one screen on either end of the pitch. But this is a recession, so that will probably have to wait! My initial plan was to simply use the Zeugo stands which are available on the Internet to build a basic one-tier stadium. Once it was done, however, I wasn't entirely satisfied with the look of the stadium. It took some time before I knew which direction I was planning to take. My ideas involved possibly building a two tier stadium, perhaps using old subbuteo terraces for the bottom tier to add some character to the stadium. I intend to cut a players entrance into one of the stands, removing some of the seats. I may also extend the seating across some of the stairways to enhance the overall look of the stadium. Of all the things that go into making this stadium, i have no dount that painting the thousands of fans necessary to go into it will be the part that makes this a lifetime hobby. 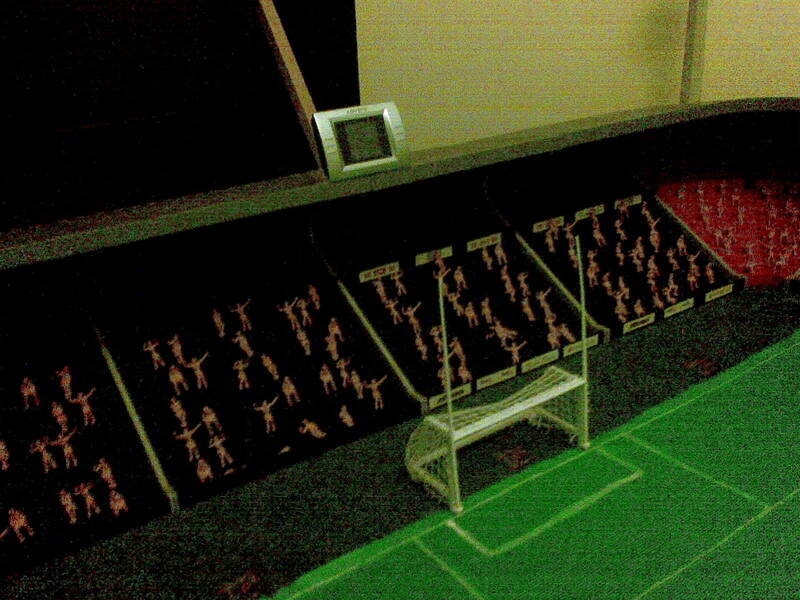 I have seen some amazing examples of Subbuteo stadia filled to capacity. (One of the best examples is the Stadium of Fingers which is filled with at least 10000 fans.) Someday I hope to emulate this, but in the meantime, I'll be using some tricks to make the stadium appear more full than it is. I can use the giant flags which get passed over people's heads to conceal large empty spaces in the stands. Also, I can put the 3-D painted figures at the front of the stands, while the seats at the back can be filled with flat printed spectators. Once the stands are all in place, I will put cardboard "walls" around the exterior. A main entrance will be built for players, with the words "Fáilte go Pairc na Ríoch" written above the entrance. At other points around the stadium, I will cut turnstile entrances. The turnstiles themselves will probably be made from paper-clips. there will not be much space around the stadium, but I hope to at lest have some "fans" making their way into the stadium, someone selling hats, flags or scarves and a chip van. I may also design a brand new roof, possibly out of 3mm perspex.